Abstract Radio Occultation (RO) data using Global Navigation Satellite System (GNSS) signals have the potential to deliver climate benchmark measurements, since they can be traced, at least in principle, to the international standard for the second. The special climate utility of RO data arises from their accuracy and long-term stability due to self-calibration. The German research satellite CHAMP (CHAllenging Minisatellite Payload for geoscientific research) provided the first opportunity to create RO based climatologies over more than 6 years. Overlap with data from the Taiwan/US Formosat-3/COSMIC (Formosa Satellite Mission 3/Con-stellation Observing System for Meteorology, Ionosphere, and Climate, F3C) mission allows testing the consistency of climatologies derived from different satellites. We show results for altitude- and latitude-resolved seasonal zonal mean dry temperature climatologies. Our results indicate excellent agreement between RO climatologies from different F3C satellites: After subtraction of the estimated respective sampling errors, differences are smaller than 0.1 K almost everywhere in the considered domain between 8 km and 35 km altitude. Mean differences (over the same domain) are smaller than 0.03 K in any case and can be as small as 0.003 K. Differences between F3C and CHAMP are only slightly larger. The assimilation of RO data at ECMWF (European Centre for Medium-Range Weather Forecasts) considerably improved operational analyses in regions where the data coverage and/or the vertical resolution and accuracy of RO data is superior to traditional data sources. long-term upper air temperature records. This has been done using data from radiosondes (e.g., Sherwood et al. 2005; Thorne et al. 2005) and from MSU (Microwave Sounding Unit) as well as AMSU (Advanced MSU) instruments on board of polar orbiting satellites (e.g., Christy and Spencer 2005; Mears and Wentz 2005; Vinnikov et al. 2006). After intense discussions over many years, temperature trend estimates based on these data sets now seem to be consistent with surface warming estimates and results from climate models but discrepancies still remain (Karl et al. 2006). Independent high-quality upper air records are therefore desirable. A promising data source for climate monitoring, which can overcome some of the problems of established ones, is the Global Navigation Satellite System (GNSS) Radio Occultation (RO) technique. It has the potential to deliver climate benchmark measurements, since they can be traced, at least in principle, to the international standard for the second (Leroy et al. 2006a, b). The RO technique has been developed in the 1960s for the study of planetary atmospheres and ionospheres (see Yunck et al. 2000 for a review). Accurate sensing of the Earth's atmosphere became feasible with the precise signals of the GPS (Global Positioning System) satellites, successfully demonstrated with the GPS Meteorology (GPS/MET) experiment. Data from several measurement campaigns (April 1995-March 1997) proved most of the expected strengths of the technique, like high vertical resolution, high accuracy of retrieved parameters, and insensitivity to clouds (Kursinski et al. 1997; Rocken et al. 1997; Steiner et al. 1999). For detailed descriptions of the GNSS RO method see, e.g., Ware et al. (1996), Kursinski et al. (1997), Steiner et al. (2001), and Hajj et al. (2002). For the general utility of occultation methods for probing atmosphere and climate see Kirchengast (2004) and Foelsche et al. (2006a). The German research satellite CHAMP (CHAllenging Minisatellite Payload for geoscientific research) was launched in July 2000 into low Earth orbit (LEO) and since September 2001 it continuously records RO profiles (Wickert et al. 2001, 2004); the mission is expected to last until 2009. CHAMP RO data, now covering more than 6 years, provide the first opportunity to create RO based multi-year climatologies. The number of RO profiles is sufficient to build seasonal (and monthly mean) zonal mean climatologies (Foelsche et al. 2008a). In April 2006, Formosat-3/COSMIC (Formosa Satellite Mission 3/Constellation Observing System for Meteorology, Ionosphere, and Climate, F3C), a Taiwan/US RO mission consisting of six receiving satellites (Anthes et al. 2000; Rocken et al. 2000; Wu et al. 2005; Schreiner et al. 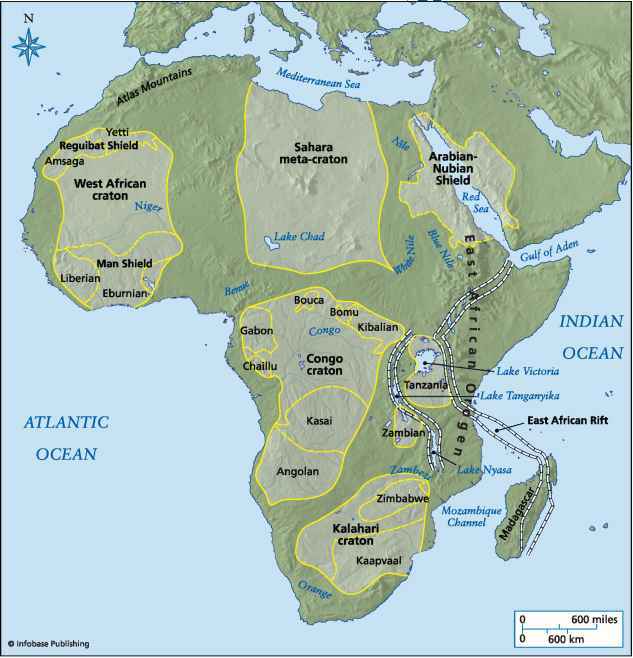 2007; Anthes et al. 2008) was successfully launched. All six F3C satellites have been launched into the same parking orbit with ~515 km orbit altitude. The satellites have then been sequentially raised to their final orbit altitudes of ~800 km. At this altitude the precession due to the oblateness of the Earth is smaller than in the parking orbit, leading to a (desired) deployment of the orbit planes to a final separation of 30°. The final orbit constellation (with optimal distribution of RO events in space and local time) has nearly been reached by early 2008. Early results on F3C climatologies have been presented by Foelsche et al. (2009). Here we continue the work of Foelsche et al. (2008a and 2009) and address the accuracy of RO climatologies by comparing also to more recent ECMWF-based climatologies and via cross-validation of RO climatologies. Section 2 shall give the context to previous work. Data and methods are explained in Sect. 3. The comparison results are presented and discussed in Sect. 4, followed by concluding remarks. The special climate monitoring utility of RO data arises from the fact that atmospheric profiles are not derived from absolute values (phase delays) but from Doppler shift (phase change) profiles. Therefore, RO measurements require no external calibration and only short-term measurement stability over the occultation event duration (1-2 min), which is provided by very stable oscillators onboard the GNSS satellites. Potential residual GNSS clock errors and clock errors on the receiving satellites can be corrected by relating the measurements to even more stable oscillators on the ground (Hajj et al. 2002). Given this "self-calibration", data from different sensors and different occultation missions can be combined without need for inter-calibration and overlap, provided that the same data processing scheme is used (von Engeln 2006) and spatio-temporal sampling (Foelsche et al. 2008a; Pirscher et al. 2007) is well understood. The active use of L-band signals with wavelengths of 19.0 cm and 24.4 cm (in case of GPS), allows for measurements during day and night and for the penetration of clouds. RO data have their highest quality at altitudes between ~8 km and ~35 km and are thus well suited to build climatologies of the upper troposphere and lower stratosphere (UTLS, which we understand as the altitude range between 5 km and 35 km). In the lower troposphere the error budget is dominated by horizontal variations of the refractivity and consequent deviations from the spherical symmetry assumption (e.g., Healy 2001a), the data can be affected by processes like signal multi-path and super-refraction (e.g., Sokolovskiy 2003; Beyerle et al. 2006), and the temperature (and water vapor) retrieval requires background information. Above ~35 km error sources like residual ionospheric effects become important, given the exponential decrease of refractivity with height and therefore a comparatively weak atmospheric signal (e.g., Kursinski et al. 1997). The horizontal resolution is low (200-300 km, Kursinski et al. 1997) compared to (A)MSU or radiosonde data, but especially for climate applications, where data are averaged anyway, the inherent horizontal averaging of RO data is also an advantage. The climate monitoring potential of RO data has been demonstrated with the aid of simulation studies (e.g., Yuan et al. 1993; Steiner et al. 2001; Foelsche et al. 2003, 2008b; Leroy et al. 2006a, 2006b; Ringer and Healy 2008). RO records have been successfully validated against (A)MSU data (Schr0der et al. 2003; Steiner et al. 2007, 2009; Ho et al. 2007, 2009) as well as data from MIPAS (Michelson Interferometer for Passive Atmospheric Sounding) and GOMOS (Global Ozone Monitoring for Occultation of Stars) on Envisat (Gobiet et al. 2007). They have been validated against climatological analyses (Gobiet et al. 2005, 2007; Foelsche et al. 2006b, 2008a) and RO data from different satellites (Hajj et al. 2004; Schreiner et al. 2007; Ho et al. 2009; Foelsche et al. 2009). The utility of RO data for monitoring tropopause parameters has been shown by Schmidt et al. (2005,2006), Borsche et al. (2007), and Foelsche et al. (2009) while von Engeln et al. (2005) and Sokolovskiy et al. (2006) have investigated monitoring of the atmospheric boundary layer with RO data. We developed a retrieval scheme at the Wegener Center (Occultation Processing System version 5.2), which is focused on minimizing potential biases and on using background information (which is needed for high altitude initialization) in a transparent way (Gobiet and Kirchengast 2004; Borsche et al. 2006; Gobiet et al. 2007; Foelsche et al. 2008a, 2009). The profile retrieval starts with phase and orbit data from GFZ (GeoForschungsZentrum) Potsdam (CHAMP, level 2 data set) and UCAR (Formosat-3/COSMIC, version 2007.1200). For the setup of RO climatologies we used the approach explained by Foelsche et al. (2008a) and (2009); the RO climatologies are obtained by "binning and averaging". All RO profiles in a prescribed geographic domain ("bin") are sampled and averaged (weighted by the cosine of the latitude), using a common (mean-sea-level, MSL) altitude grid with regular 200 m spacing of altitude levels. The cosine-weighting accounts for area changes between meridians at varying latitudes. We use "fundamental" bins with 5° x 60° width in latitude and longitude to build monthly mean climatologies. From the 6 fundamental bins in each 5° latitude band we derive 5° zonal means by weighting with the respective number of occultation events. The basic latitudinal resolution (used for the results shown here) finally is 10°, i.e., each of the 18 latitude bands (pole-pole) contains two 5° bands, and the mean profiles for these two bands are averaged, weighted with the surface area of the respective bins. Compared to direct averaging, this particular spatial averaging approach slightly reduces the effect of uneven sampling within the latitude bands. Seasonal climatologies are obtained by averaging over three monthly climatologies. For comparison we use analysis data from the European Centre for MediumRange Weather Forecasts (ECMWF), since they have widely recognized quality, adequate spatial and temporal resolution and contain a vast amount of observations, assimilated in a statistically optimal way. ECMWF operationally produces daily analyses for four time layers, 00, 06, 12, and 18 UTC (coordinated universal time), by dynamically combining a short-range forecast with observational data via four-dimensional variational data assimilation (ECMWF 2004). On February 1, 2006, a major resolution upgrade has been implemented at ECMWF with a vertical resolution increase from 60 to 91 levels and a raise of the model top from 0.1-0.01 hPa. The horizontal resolution has been increased from T511 (spectral representation with triangular truncation at wave number 511) to T799 (Untch 2006), allowing more atmospheric variability to be represented. On December 12, 2006 ECMWF started operationally assimilating RO profiles (Healy 2007). provides furthermore an unplanned test of the robustness of single-satellite seasonal climatologies. Due to technical problems, there is a period of about five weeks (from July 3 to August 8) where no data from CHAMP are available. Fortunately, RO data from the satellite GRACE (Gravity Recovery and Climate Experiment), which has essentially the same receiver and associated error characteristics as CHAMP (Wickert et al. 2005), are available for this time period. We thus decided to fill the "gap" in the CHAMP record with GRACE data (based on GFZ input data). 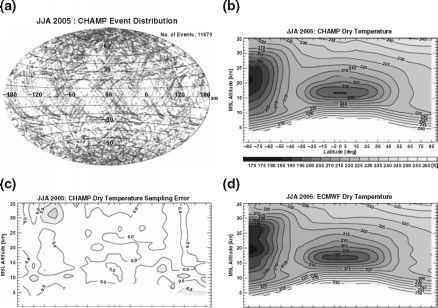 Figure 1 shows the distribution of ~11 700 CHAMP RO events during summer 2005 (a), the related RO dry temperature climatology (b), the estimated sampling error (c), and the ECMWF-based reference climatology (d). A selective sampling effect from different penetration depths of RO events leads to the chosen tropospheric cut-off heights for CHAMP climatologies (Foelsche et al. 2008a). atmospheric evolution we use ECMWF analyses, whose four time layers per day are sufficient to sample the diurnal cycle up to the second harmonic (the semidiurnal cycle). We estimate the sampling error by comparing climatologies derived from vertical ECMWF profiles at the RO times and locations with climatologies derived from the complete 4D ECMWF field (see Foelsche et al. 2008a, for further details). The absolute accuracy of latitude-resolved RO climatologies is hard to determine to a level < 0.5 K, since all available validation data have their limitations as well (e.g., Gobiet et al. 2007). In this section we want to further test RO data, and raise confidence in their climate utility, by comparing with ECMWF-based climatologies and via cross-validation of RO climatologies from different satellites. The comparison between CHAMP and ECMWF is based on difference profiles. For each CHAMP RO profile we extracted a co-located vertical ECMWF profile from the nearest time layer of the analysis at the mean location of the (not exactly vertical) RO profile, using spatial interpolation. We define the mean location as the latitude and longitude of the point, where the straight-line connection between transmitting and receiving satellite during the occultation event touches the Earth's ellipsoidal surface (corresponding to the tangent point location of real RO profiles at about 12-15 km altitude). We note that ECMWF profiles have been used for the high-altitude initialization of the RO profiles via statistical optimization (Healy 2001b; Gobiet et al. 2007); results above ~30 km are therefore not completely independent from ECMWF data. Figure 2 shows systematic differences between ECMWF and RO climatologies (taking RO as reference). JJA 2005 (a) is also representative for all previous summer seasons (see Fig. 3 in Foelsche et al. 2008a). The wave-like bias structure in the southern winter polar vortex (Gobiet et al. 2005) is caused by deficiencies in the representation of the Austral polar vortex in the ECMWF analyses (see Fig. 1d). This feature appears also during JJA 2002-2004.
analysis fields and obviously corrected these bias problems (see also Healy 2007): In JJA 2007 (c), systematic differences exceeding 1 K are entirely confined to altitudes above 30 km; the wave-like bias structures known from all previous summer seasons have disappeared. F3C results for JJA 2007 (d) are very similar to CHAMP results, with even smaller differences above 30 km (so far, we used only closed-loop F3C data above 8 km). After the assimilation of RO data, ECMWF analyses are certainly not an independent validation data source anymore. Nevertheless, the continuous convergence between RO and ECMWF with improvements at ECMWF and the assimilation of RO data suggests that the differences known from previous seasons had largely been attributable to the ECMWF rather than the RO data. In the near future we will investigate the agreement between RO climatologies and global analyses from NCEP (National Centers for Environmental Prediction). climatologies are surprisingly robust, even when several weeks of data are missing. The systematic difference for June and August between ECMWF and CHAMP alone (bottom) displays essentially the same large scale features as Fig. 2b; only at small scales there is more variability. It seems therefore justified to combine data from CHAMP and GRACE to a single record.